Get to know Dilara from Azerbaijan! It’s been a long way for a 29-year-old Dilara Kazimova to join the Eurovision family and she’s now ready to take on all comers and gain the admiration of new fans in Europe. 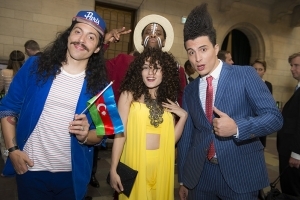 First-time Dilara took her chance at Azerbaijani National Selection as a member of band Unformal in 2008, when country debuted in the Eurovision. The band finished second in the final. Later, in 2010 Dilara qualified to the final as a part of a female duo Milk&Kisses. The same year she went to represent Azerbaijan at another international music festival New Wave in Yurmala, Latvia. Dilara has what it takes to be a standout. Early vocal training gave her a great range and vocal discipline. As a child, she was surrounded by music from opera and the classics, to the rock legends like Freddie Mercury. Not to mention the influence of traditional Azeri folk music. She’s taken elements from each of these diverse genres, developing her own unique vocal style brilliantly showed at this year’s Azerbaijani final of Böyük Səhnə. Dilara is remarkably flexible, handling a Motown-inspired Mercy with soul and impressive energy. or a jazzy cover of Hometown Glory which may actually be as good as Adele’s original effort. Dilara began to sing professionally at age 14, and for the last 15 years have been experimenting with a variety of styles as she trained her versatile voice. She was introduced to music professionally at the U. Hajibekov Baku Academy of Music. She graduated as an opera singer. Besides music Dilara has a passion for painting and acting. Her filmography includes Try, do not breathe (2006) and In-between (2007), where besides acting she has also created a soundtrack Sonsuz you. One of her next planned steps for future is to combine music with acting in musical. Dilara is in her top shape as an artist. Fans of live music in Baku knows her as one of the most-wanted and most discussed guests of the city’s modern alternative stage. In 2014, Dilara also went for Ukrainian version of the top vocal show “The Voice”. When she’s got a chance, Dilara spends her spare time in the yoga studio or reading books on psychology. She also loves animals and never wears fur in life or on stage. DilaraKazimova will perform her entry song “Start a Fire” in the first Semi-Final on the 6th of May, 2014 at B&W Hallerne in Copenhagen.